One of the most widely used roofing materials in America, asphalt shingles are known for their affordability and their ease to install. They are a timeless classic, having been used on roofs for over 100 years. Asphalt roofing come in a wide variety of styles and colors, making them a versatiles choice for almost any home. To understand asphalt roofing, it’s important to understand that this roofing comes in two basic types: organic and fiberglass. Organic asphalt shingles typically have a base of paper, wood fiber, cellulose or other formerly-living material. This base material is then saturated with asphalt to make it waterproof, with granulars and adhesive salt used to finish the shingle. Organic asphalt shingles tend to be very durable but can also be flammable, giving them a lower fire class (B) than some alternative materials. One such alternative is fiberglass asphalt shingles, which hold a class A fire rating. Instead of paper, these shingles use a base of resin-coated fiberglass. While fiberglass asphalt shingles have the same appearance to organic, they are more prone to algae growth, which can give them a dirty appearance over time. In spite of this, their superior fire protection has been enough of a benefit that fiberglass has slowly overtaken organic shingles since the 1980s. Consumer are happy to accept some additional upkeep when they know it will help keep their families safe from harm. Another variation in asphalt roofing is between 3-tab and architectural shingles. 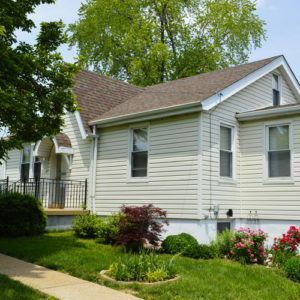 The most common of the two is the 3-tab shingle, due to its affordability. The low cost of 3-tab is the result of its lightness, with less material used to produce them. Because they use less material, 3-tab is also thinner, provides less protection, and has a shorter lifespan than its counterpart, the architectural shingle. Architectural shingles, also known as dimensional shingles, are thicker and tougher than their 3-tab cousins. This is because of the two layers of shingle that are bonded together into one shingle, which help to produce the desired “dimensional” appearance. The two-layered tile casts a shadow on the roof, giving each tile an appearance that is closer to wood shake, without all of the upkeep that roofing solution demands. While 3-tab may only last a homeowner 15-20 years, architectural shingles can last 20-30 – with some warranties promising up to 50 years of protection! This is a significant difference! Architectural shingles tend to have a longer lifespan due to their superior ability to withstand the elements. While 3-tab is more suited for steady climates, those with a spectrum of weather conditions may want to consider another option, like architectural roofing. Not only can architectural shingles withstand rain and snow better than a basic 3-tab shingle, they can endure wind speeds twice as strong! While a 3-tab is able to endure winds up to 60mph, the average architectural shingle can last in winds as strong as 120mph! This has made them a preferred material for homeowners who see this type of weather quite frequently, such as those who live in regions of the country commonly affected by severe weather. Of course, these premium features come with a premium price tag; not every homeowner is prepared to make that kind of investment, no matter the benefits! That is why it’s important to talk to a contractor at a John Beal Roofing. Your John Beal contractor will be your personal roofing expert, discussing with you the Pros and Cons of each type of roofing material, as well as providing you with a FREE ESTIMATE, so you can make an informed decision about your roof.